If you love light, today is not your day. It is the winter solstice. The shortest day of the year. Following the longest night. No other day will have less light. It’s the first tick of astronomical winter’s clock. But in the Chicago area, the only thing that says “winter” is the date on the calendar. It’s been a month full of talk about El Niño, a warming trend. Spring shrubs, deluded by cold nights and daytime temperatures fluctuating into the upper 60s, push out flowers. Lilacs hint purple. Forsythia opens its blooms. Listen! Look up! The sandhill cranes migrate over us by the thousands, belatedly waking up to the realization they’ve been lulled into lollygagging up north. They dallied a little too long in Wisconsin. The bison wonder why they bothered with their shaggy overcoats. … the light we took for granted, that turned the savanna edges and prairie misty and luminescent. We long for the light. As I’ve felt the darkness brush against me, surround me, and submerge me this month, I’ve thought about what’s coming. Christmas. A day dedicated to light. This year, Christmas morning will dawn with a “Full Cold Moon” or “Long Nights Moon” as Native Americans once called it. It’s the first full moon on Christmas since 1977 — more than 35 years ago. We’ll wake up to it when it rises at about 6 a.m.
All photos by Cindy Crosby (top to bottom): storm over author’s prairie patch, Glen Ellyn, IL; full moon with Venus rising over author’s prairie, GE; partial moon over author’s prairie, GE; forsythia flowering December 18, The Morton Arboretum, Lisle, IL; sandhill cranes over Springbrook Prairie, Naperville, IL; bison herd at Nachusa Grasslands, Franklin Grove, IL; sunrise, Hidden Lake Forest Preserve of DuPage County, Glen Ellyn, IL; sunset, HL, GE; prairie edge, NG; December morning sundog, Chicago, IL; full moon, GE, IL. “Where there is no vision, there is no hope.” George Washington Carver. It’s an unseasonably warm day in December. Fog shrouds the prairie. Everything softens. Fades. Blurs. 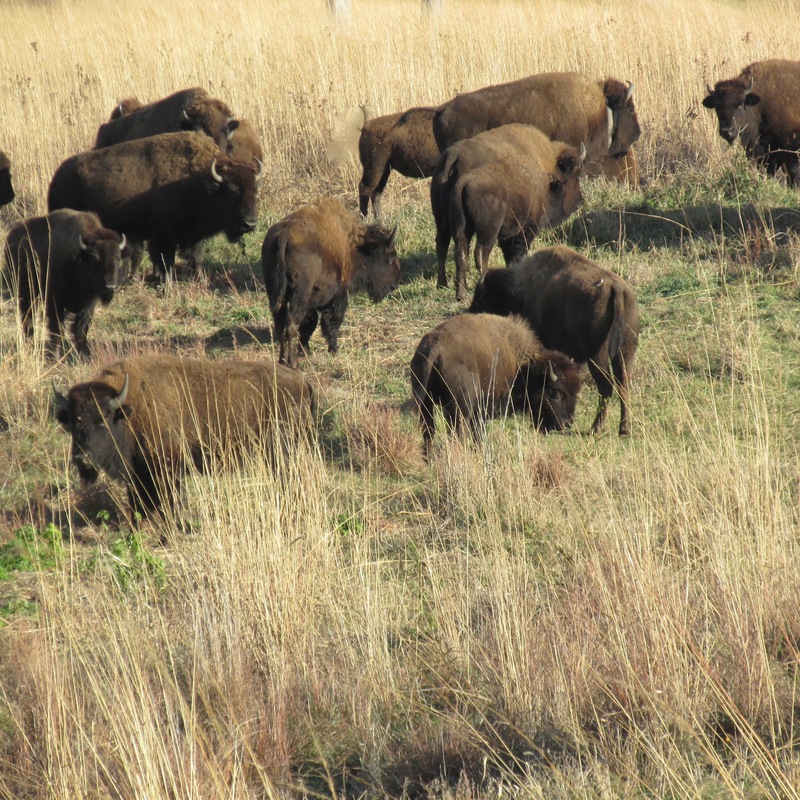 Bison haunt the tallgrass, elusive and half-hidden. Illinois once had more than 22 million acres of prairie. Today, only 3,000 original acres of tallgrass remain. A ghost of what once was. When we went looking for what was left of the prairie, we found only scraps. Prairie was found in pockets and corners of land where the farmer’s plow and development could not reach. Along old railroad right of ways. Isn’t it ironic that these neglected, overlooked places were virtual time capsules? That the cemeteries of the dead became a repository for the living? For hope? A springboard for rebirth. Resurrection. It takes vision to imagine a better future. To remember — and believe — that hope for the future may be found in the most unexpected places. Where will you look? All photos by Cindy Crosby except where noted (top to bottom) : prairie in the fog, Nachusa Grasslands, Franklin Grove, IL; bison in the fog, NG; misty December evening, NG; stand of trees in the tallgrass, NG; rocky knob, NG; railroad tracks, Bosque del Apache, San Antonio, New Mexico — photo by Jeff Crosby; tombstone, Chapel Hill Cemetery, just outside Rochelle, IL; CHC:; road through the bison unit, NG. Take a prairie hike on a December day, and it’s easy to forget some of the essentials. No, not gloves and a hat. The prairie essentials. Those now-invisible, dimly-remembered elements of the prairie; those moments in the tallgrass that first caught your heart. Have you forgotten? How lush the prairie is in the spring! A thousand different possible greens. Do you remember? The moment when you first saw the lupine blooms in the spring. You stood on the path, stunned. …the sound of the frogs in the wet prairie, vocalizing so loudly you couldn’t hear yourself think. The deep “moo” of the bullfrog, reminding you of where its name comes from. The strummed comb of chorus frogs. The sleigh bells of spring peepers. So, that spring day, you let go of trying to think. You just listened by the side of the pond. Remember? Those essential moments. Those essential images. Out of season. Waiting to be taken out and enjoyed. …you begin to recall… How, one spring, the lone bison stood silhouetted against the aluminum sky like a buffalo nickel. Or how you sat for hours by the bluebird house, watching for small chips of feathered sky to fly by in the warmth of late summer. …you suddenly remember the day you stumbled across the fringed gentians, nestled deep in the fall grasses. Have you forgotten? The butterfly you glimpsed, gently tasting the prairie cinquefoil with its slender feet? The sounds of the woodpecker drumming in December… does it conjure up the memory of the dickcissel calling its own name in July? The prairie essentials. Dimly remembered in December; triggered by sights, smells, sounds. You believe — although you can’t see them — that you will encounter them again. You know the deep roots of grasses and forbs continue to plunge more than 15 feet into the earth, even if you can’t see them. They are there, keeping the prairie grounded. While on the surface, small tracks speak of invisible things, temporarily hidden. …will give way — soon enough — to the freely-flowing current in July. I love the prairie in all its rhythms; marvel at its winter wonders. But when I see the prairie in December, I see more than what my eyes tell me. My heart remembers the prairie essentials; no matter what the season. All photos by Cindy Crosby (top to bottom): Prairie Visitor Station, Schulenberg Prairie, The Morton Arboretum, Lisle, IL; bridge over Willoway Brook, SP; lupine (Lupinus perennis), Nachusa Grasslands, Franklin Grove, IL; bison in the snow, NG; bullfrog, NG; false sunflower (Heliopsis helianthoides), SP; bison, NG; bluebird house, NG; fringed gentian (Gentianopsis crinita), NG; red admiral on prairie cinquefoil (Potentilla arguta), NG; dickcissel, NG; sun and snow, SP; animal tracks, SP; Willoway Brook SP; Clear Creek, NG; bridge in the snow, SP. The opening quote: “It is only with the heart that one can see rightly; What is essential is invisible to the eye” is from The Little Prince by Antoine de Saint-Exupery. Thanks to Jeff Crosby for first introducing me to the book, many years ago. A heavy November snow steamrolled the prairie into submission. A 50 degree day or two then melted the snow into invisibility. What’s left behind around Willoway Brook looks as if a giant paperweight has pressed the tallgrass flat. December on the prairie opens with a brand new look. Before the deep snow, the prairie grasses brushed my shoulders, towered over my head; a thick, vertical wall. Now, in many places, a springy carpet of grasses lies under my feet. For most of the autumn, the prairie has been drawn by an artist who loved vertical lines. But now, with the verticals knocked to the ground, a new shape takes prominence. Circles. One of the simplest shapes in geometry. I see them everywhere. The prairie dock leaves, drained of their chlorophyll, remind me of a dress I once owned made of dotted swiss material. The globes of bee balm repeat the circular pattern; clusters of tiny yawning tubular tunnels. Sunken balls of carrion flower catch the afternoon light. Tall coreopsis seeds dot the sky like beads suspended on wires. Overhead, thousands of cranes are migrating south, punctuating the quiet with their cries. They circle and loop; circle and loop. 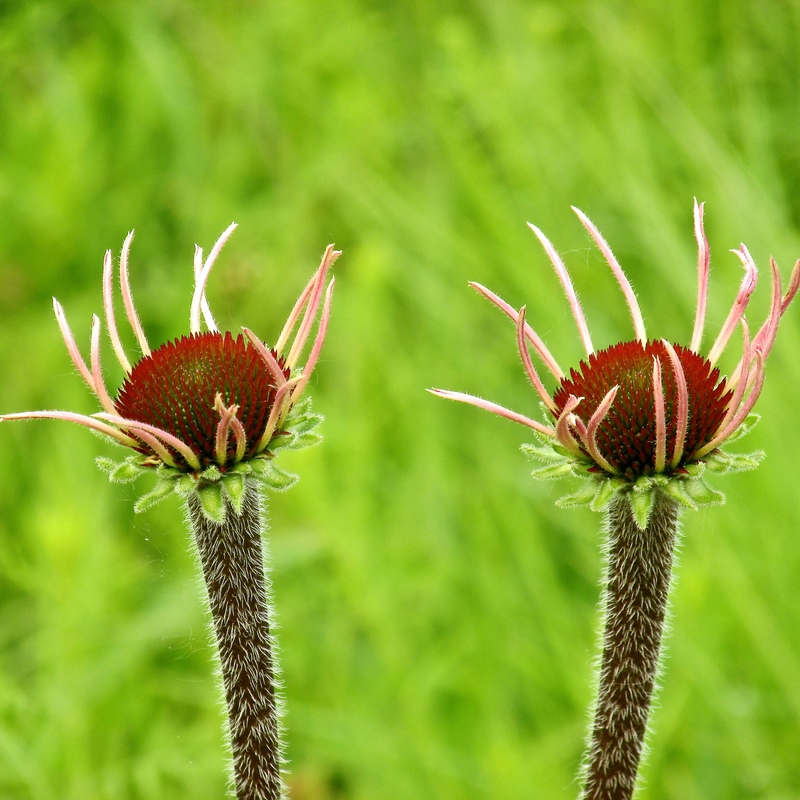 The gray-headed coneflower seeds have half-circle pieces missing. Crinkled round ball galls look like they’ve dropped from another planet. Anybody home? No sign of life inside. Even the downy leaves of ashy sunflowers echo the pattern; try to loop into circles. The compass plant leaves curl into ringlets, stippled with tiny full moons. I miss November’s bold, vibrant tallgrass, upright and waving in the wind from horizon line to horizon line. A flattened prairie seems defeated, somehow. Beaten down by the elements. But I’m glad for the unexpected gift of seeing a prairie pattern I might have otherwise missed. Losing a familiar way of viewing the world opens up a different perspective. Today, I’m seeing the prairie in the round. Who knows what else I’ll learn to see in a new way before the year is done? All photos by Cindy Crosby taken at the Schulenberg Prairie, The Morton Arboretum, Lisle, IL except where noted (top to bottom): Willoway Brook; prairie grasses, prairie clover (Dalea purpurea, Dalea candida) , prairie dock leaf (Silphium terebinthinaceum), bee balm (Monarda fistulosa) ,carrion flower, tall coreopsis; sandhill cranes; Springbrook Prairie, Naperville, IL; gray-headed coneflower (Ratibida pinnata; ball gall; ashy sunflower (Helianthus mollis); compass plant (Silphium laciniatum); compass plant(Silphium laciniatum).